In honor of my blog site remodel 🙂 I thought I’d share part two of my million part Kitchen Remodel series ;). If you missed part one of my Kitchen Remodel, click here. So, I called “my contractor” and then I got things with the flooring, cabinet and counter top folks set up for the week between Christmas and New Year’s. I grew up a contractor’s kid and I have pretty high expectations when it comes to this remodeling stuff (read: higher expectations than the existing workmanship in other parts of our home) … so, I called up Benefiel Construction (aka Dad and Mom) and begged them to cancel their vacation that week and instead work for me and fix the damage done by the bad behavior of my naughty fridge. My parents took pity on me and took on my job. In case you missed it, I have the best parents and I am not afraid to tell ya all about it. Tear out the wall between the kitchen and entryway. Despite my overwhelmedness (yes this occasion calls for a new made up word), my parents are pros and were doing great. 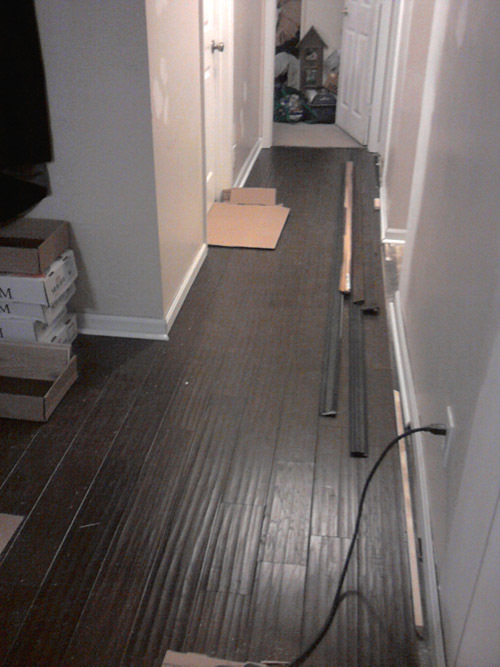 Things went pretty well as they began ripping out the wall and tearing up the floor and as I began juggling schedules with flooring delivery and cabinet delivery/ installation. 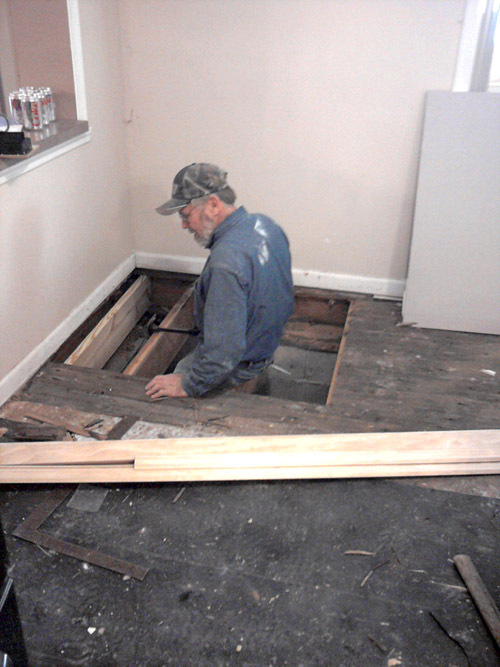 Surprise #1: No, it wasn’t my dad doing a disappearing trick into the floor… It was a huge gaping hole (read: almost non-existent sub-floor) underneath the four floor cabinets that were holding my zillion pounds of full canning jars from this summer’s harvest. Seems as though previous contractors may have preferred the method of covering it up with new flooring instead of fixing such an issue, I mean it is a corner, right? No crazy canning lady is going to put a cabinet full of heavy jars over top of the non-existent floor that she foolishly thought existed –ya know, under her floor. Daddy tried a different method. 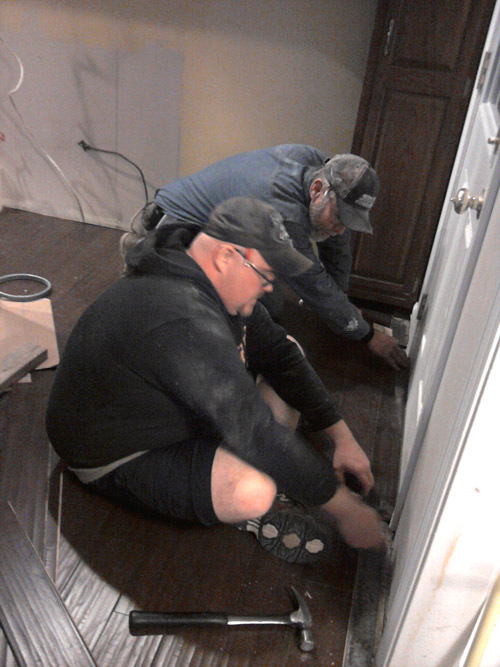 The “do it right–fix it first, then put down new flooring” method. See why I prefer my contractor? Surprise #2: Ya see that wall there? 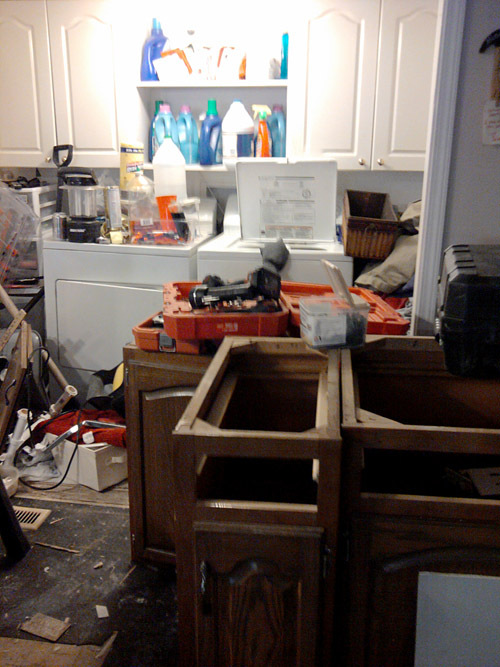 Those cabinets were suppose to still be there… but ya see, our fridge was not the only naughty one in the house… apparently her cohort–the leaky drain–were on a mission to secretly destroy my home. Apparently our drain was a rebel… didn’t like to go with the flow. Instead she liked to flow backwards into the house and under the sink cabinet– which despite being solid wood, didn’t take to well to the abuse. A quick call to the Cabinet Barn and they had me set up with a new sink cabinet and added to my order/ delivery for later that week. In the meantime, many early mornings and late nights of hard work produced a floor. And the heavens opened and the angels sang! 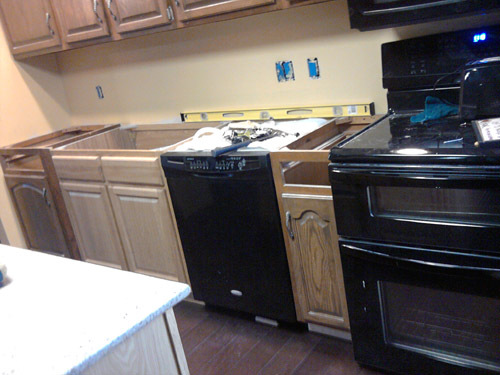 Then The Kitchen Specialist delivered/ installed the cabinets and granite by the end of the week and the kitchen began to look like a kitchen. 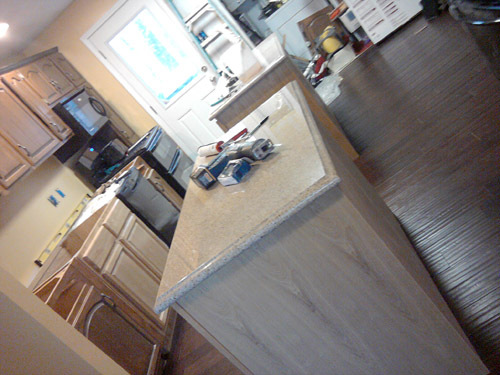 To be continued… Part Three: The Kitchen is Done, Dude. 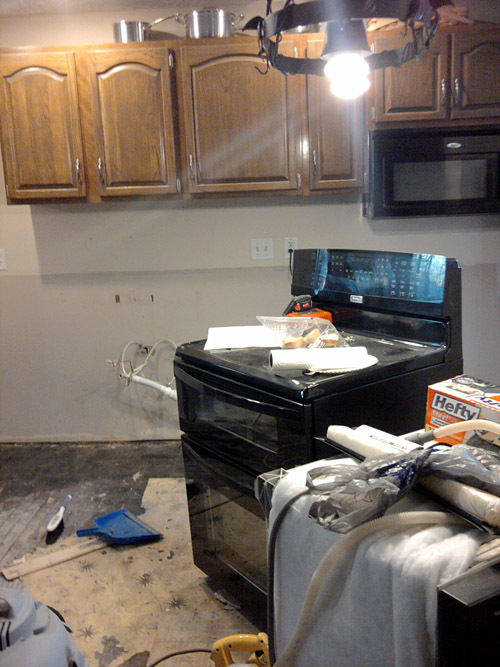 Oy, any remodel is hard, but a kitchen??? I've been there and never want to go back. I can remember washing dishes in the bathtub. Yuck! I'm SO glad you have great parents that have stepped up to help. I'm crossing my fingers that there are no more surprises and your kitchen is finished quickly. I am so jealous of the new kitchen though, it's going to ROCK when you're all finished. It looks amazing so far!! Can't wait to see more! OOh, I LOVE the floor! You are lucky to have mom and dad to help! Wow, what a lot of work! We've been remodeling for about 6 years now (read- tired husband, frustrated wife!). I also prefer my "general contracter," aka Dad! He listens to exactly what I want, and never cuts corners! Hooray for super parents! I know how it was with our remodel and it was definatly not to the extreme of yours! It all pays off in the end! I just stumbled onto your blog and it's fantastic! Love your witty fun writing and we're remodeling our kitchen too! We are nowhere near your stage. We just ripped down one wall out of two. Hopefully it doesn't take 6 years like Holly and I don't get any surprises under my sink! I was going to say, "I can't believe they didn't put a sub floor in." But believe me, I do believe it. 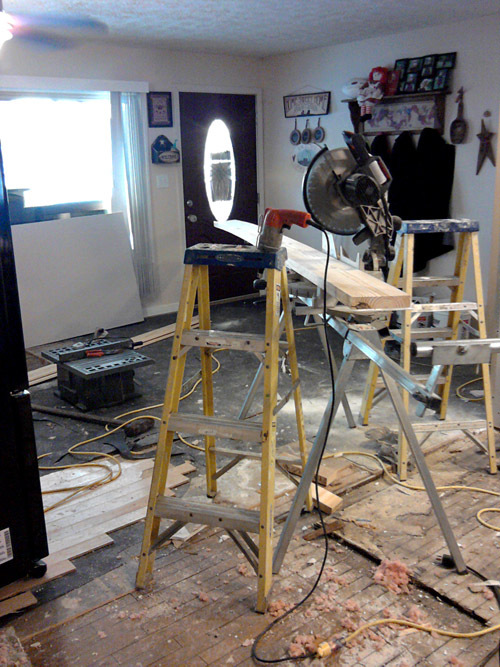 My hubby has done a lot of remodeling in his life, and you wouldn't believe some of the stories he's told me. Thank goodness your dad is doing it for you, at least you know it's being done right! Can't wait to see the finished product. Love it! 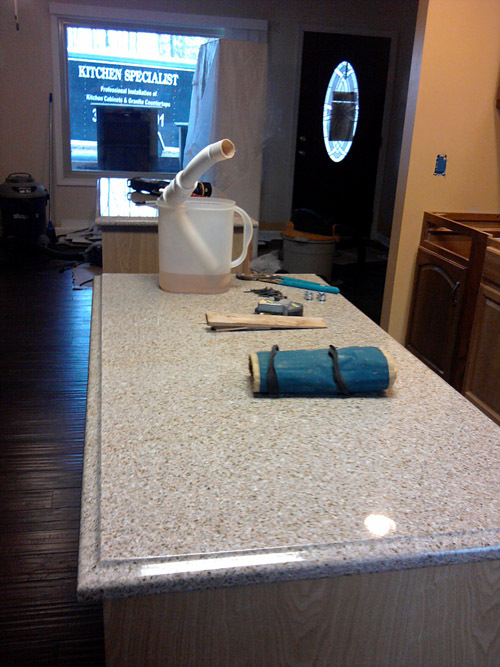 I am so jealous you have 2 islands and granite counter top. Can't wait to see the finished product and thank goodness for your parents! First i tell you, You are doing great work. You are doing work with a plan this is the great plan. I have to say, although it’s such a mess when it’s occurring, there’s also nothing like the smell of progress! Thanks to you.